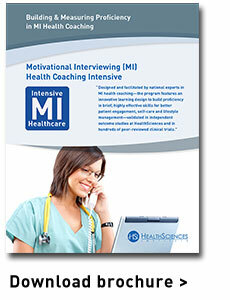 The Registered Health Coach (RHC) program is designed to build patient engagement and behavior change skills grounded in the only approach proven effective, practical and appropriate in a health care environments focused on delivering measurable patient results: Motivational Interviewing (MI) Health Coaching. RHC combines this brief and highly effective behavior change method with online, interactive, competency-based learning activities. RHC is designed for health and care management professionals as well as direct care providers from any discipline or setting. First described by psychologist Bill Miller over 25 years ago, MI is backed by over 200 rigorous clinical trials, with dozens of studies on health care topics ranging from weight management, disease self-care, treatment adherence, among others. Two recent meta-analyses (studies that compare and contrast findings from several studies) find MI to be both effective and well-suited for health care. Lundahl, et al. (2013) find the impact of MI to be "robust" regardless of patient characteristics or location. VanBusrk & Wetherell (2014) find MI particularly effective in increasing change readiness and action toward change goals in primary care evaluations of MI. Both remark on the fact that MI is particularly effective in brief contact, as few as one in number. Since no other approach remotely reaches this effect, MI is the basis for RHC because MI is more than an evidence-based approach, it is the only evidence based approach. As Oregon Health & Science University Associate Professor of Medicine, and two time NIH-award recipient Dr. Susan Butterworth describes this approach (MI) is the "only technique validated to have been fully described and consistently demonstrated as causally and independently associated with positive behavioral outcome (Butterworth et al, 2007). RHC is built on the strong foundation of CCP, introducing key models, strategies and interventions for population health improvement, evidence-based chronic medical care and self-lifestyle management and health behavior change (health coaching)--all of which prepare health coaching and health management practitioners for success in the new health care environment. From Dr. Edward Wagner (Chronic Care Model founder—a template for the medical home), Dr. Thomas Bodenheimer (Primary/chronic care redesign, self-care support pioneer), Berkeley Dean of Public Health and lead on the largest physician practice performance studies and ACO advocate, Dr. Stephen Shortell, who emphasized engaging and preparing the health care workforce in population health management, chronic care, self-care support, and more effective, patient-centered care approaches played a key role in health care improvement. However, with an estimated 85% of avoidable costs due to health behaviors and choices, we cannot change health care without being prepared to effectively and briefly guide patients at all risk levels through change. Measurement plays an important role in evaluating the effectiveness of any training program. It is also essential to building proficiency in the complex skill-set of MI. Health management, like any health care service should be an evidence-based practice. HealthSciences Institute's programs require standardized knowledge (CCP) or practice proficiency (RHC) assessment. This is a major reason why the ParnersInImprovement Alliance and Health Coach Registry is the #1 health coach credentialing verification source for population health management (PHM) professionals: Wellness, Health and Care Management (in addition to the valuable CCMC for case managers). Purchasers, hirers, as well as patients know that a CCP and RHC have completed a nationally recognized program and test of knowledge and/or performance in the rapidly growing field of population health management. With over 20 certifications--many developed by laypeople, credibility and documentation of skill is essential. Registered Health Coach includes three levels of proficiency. Each is assessed using the HCPA. Following Registered Health Coach (RHC-I), RHC-II or Specialist Proficiency in MI Health Coaching for wellness, health management or care management specialists. Once RHC-I MI Health Coaching program has been completed, the student may either register for the RHC-II MI Health Coaching Intensive, or complete skill-building alone or with the help of an MI mentor. The fee for the second assessment and feedback/coaching session is included in the RHC-II MI Intensive tuition. Qualification for RHC-III or Expert/Mentor level proficiency may or may not require additional HCPA reports and feedback sessions depending on the aptitude of the practitioner and their performance on prior codings submitted for RHC-I and RHC-II. Mentor training through HealthSciences or another organization is required Following RHC-III, practitioners may choose to apply for the MINT New Trainer Program sponsored by the MINT group. Many continue to serve in mentor roles in their organizations, while new employees complete CCP during the first six months of employment and RHC-I Health Coaching Intensive when prepared. 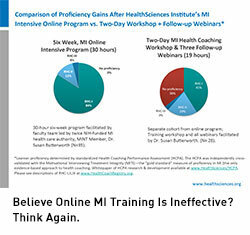 Our research shows the results only get better with great MI proficiency for outcomes such as engagement. While MI workshops can be effective, building proficiency in MI requires a multicomponent approach like any complex skill set, e.g., golf, piano. 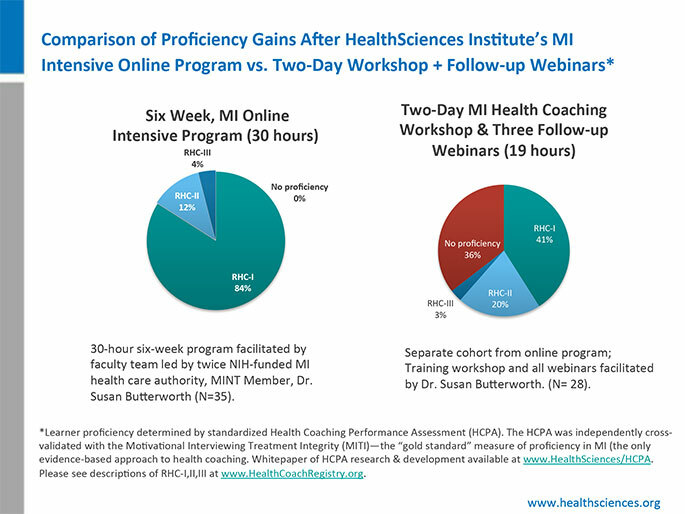 Proficiency in the approaches and methods of MI requires an immersion experience (like a action learning-based workshop by a MINT trainer or the MI Intensive online program), guided practice, assessment with a standardized, validated tool or system, e.g., MITI, HCPA/HCQI, and feedback from an expert. Given the strong preliminary results achieved with the RHC-I MI Health Coaching Intensive, and its integration of the key requirements, it will be HealthSciences preferred method of delivery. This option allows HealthSciences the option to extend the reach of our people and our programs and reduces travel feeds and expense for clients. To date, HealthSciences has invested over $2 Million in research, project development and technology to support our behavior change innovation, software tools, and free or reduced fee programming. Since we use national experts this also provides more options for access to worldclass experts. A number of organizations have partnered with HealthSciences to design, implement and evaluate plans for targeting outcomes critical to the organization's success, e.g., nurse health coaching proficiency, member engagement specialist skills and member engagement, disease state clinical outcomes, among others. Organizations have chosen both the on-site worksite and the RHC-I MI Health Coaching Intensive online option. Both have proven effective in pre/post standardized evaluations of proficiency as well as member engagement. For programs of this scale, members of the HealthSciences team with experience in process improvement, technology, as well as staff sourcing, selection and orientation, performance measurement/management are often included. Plans for developing an internal mentor team and internal quality improvement process and tools are designed. These types of projects average six months to two-years in duration, but yield returns on investment that are typically far better than other options. Given the many challenges to generating accurate and meaningful outcome data from traditional pre/post study designs, HealthSciences provides outcome data to all partner organizations regarding staff proficiency to evidence-based approaches and program quality using standardized, validated measures and reporting systems. HealthSciences has demonstrated that CCP and RHC programs can deliver significant improvements in workforce proficiency and adherence. In addition, independent evaluations have found that this level of increased proficiency is associated with improvements in member engagement in large telephonic programs. Please refer to reported in recent press releases and national presentations for more information. We are also happy to share case studies. Who is Eligible for Registered Health Coach? Any clinical or nonclinical health care professional is eligible for RHC. Population health improvement, including wellness, health management and care management are among the fastest growing fields in health care. The demand for individuals who have completed an evidence-based curriculum and demonstrated proficiency in the only brief, highly effective approach for health coaching will only grow in coming years as the two primary drivers of unsustainable health care costs are the reliance on acute care-oriented approaches for problems that cannot be solved medically, combined with the persistent rise in chronic disease prevalence (the U.S. diabetes rate has tripled since 1987), fueled by obesity rates double those of Europe's. Can the Training Requirements for Registered Health Coaching be Waived? HealthSciences does not typically waive RHC requirements. The learning steps for RHC and the proficiency levels were not created by HealthSciences, but HealthSciences has incorporated them into the requirements for RHC recognition. RHC is the second step in a learning ladder that begins with CCP and ends with RHC-III (Expert/Mentor). RHC reflects a competency modeling approach and framework, whereby each level builds on a previous level. Competency models are widely used in most other industries. They focus on what a professional can DO versus the legacy approach which focuses more on what a professional has DONE, e.g., degrees, x years of work experience. This is the type of framework recommended in the institute of Medicine's Health Professions Education Report and endorsed by the professional associations represented. This creates the credentialing-outcomes link that is often missing in most certification and accreditation programs. By focusing on building and recognizing knowledge, skills and abilities that link with better patient outcomes versus those advocated by specialty organizations. Of course the two approaches are not mutually exclusive and HealthSciences recognizes the value of both. Practitioners are welcome to submit documentation for a program completed that matches the framework as described above, including the CCP curriculum. Please submit the following information: C.V.s of all presenting faculty, a detailed summary of the curricula and learning materials or references, evaluation data demonstrating outcomes of the program using standardized, validated measures (note: participant evaluations are neither), along with other pertinent facts, e.g., publications in the field of motivational interviewing, health behavior change, population health, chronic care improvement. Documentation, along with a cover letter may be submitted to support@healthsciences.org with the sbect line "Application for Waiver Review". Any incomplete submissions cannot be evaluated. 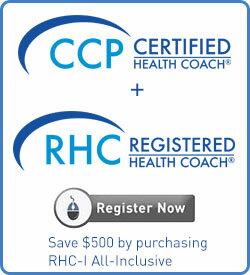 To achieve RHC-I certification, practitioners must complete CCP and the RHC-I MI Health Coaching Intensive program (given the synergy between CCP and RHC), for the ideal learning experience and the best value, we recommend our RHC-I All-Inclusive Option, which combines CCP and the RHC-I MI Intensive course (which includes the final HCPA proficiency assessment) and saves the applicant $500. Registrants for the All-inclusive Registered Health Coach (RHC-I) program must complete each of the program requirements within a two-year time-frame. Please note that once each separate program is started, it must be completed within the allotted time for that program (CCP: Twelve Months / MI Intensive: twelve weeks). This option is ideal for individuals who have previously completed CCP. For others, while CCP is a highly recommended prelude to RHC-I MI Health Coaching Intensive, it is not required. CCP could be completed at a later date. Also, while these programs are independent, the RHC-I MI Health Coaching Intensive draws on MI content and learning activities from the CCP module four. In either case, all RHC candidates must submit a health coaching audio sample and which is evaluated using a software-based, standardized, MITI-validated tool (HCPA). For organization partners receiving or planning a HealthSciences Workforce/Organization Development program a workshop and/or RHC-I MI Intensive Program may be delivered to all or some staff. While the process may be adapted, all training and proficiency requirements still apply. The RHC-I MI Health Coaching Intensive is a self-paced, self-directed, 30-hour, six-week program designed for clinical and non-clinical members of the health care team. It is an "asynchronous" learning program i.e., it may be started and completed within a six to twelve week period. One four-week course extension is allowed (a $100 administrative fee is due) and the extension must be requested within twelve weeks of registration. New registrants for this program are accepted anytime. IMPORTANT NOTE: The CCP 5.0 manual is required and may be purchased, if needed, for $150 ($100 off the list price of $250, with free shipping). Purchase the CCP manual now. Enter code CCPC to receive the special manual fee. There are two learning requirements for RHC-I: CCP & RHC-I MI Health Coaching Intensive include CCP RHC-I MI Health Coaching Intensive, which includes the final HCPA proficiency determination in the fee. Training formats may vary for organizations. Since 2003, the award-winning core curriculum in population health improvement, chronic diseases, lifestyle management and MI-based health coaching. CCP prepares practitioners in basic health coaching knowledge and skills required for engaging patients and partnering for lifestyle change, treatment adherence and disease self-care. The MI workshop and the RHC-I MI Health Coaching Intensive (includes the final HCPA proficiency test) are two options for intensive training in MI health coaching. Unlike traditional MI workshops, the sole focus of both is the use of MI in brief health care encounters to support lifestyle management, treatment adherence, disease self-care, care transitions. All faculty bring a minimum of five to twenty years exclusively training health care practitioners. Upon completion of the training requirements, self-study, and practice as needed, candidate submits an audio work sample with an actual patient (de-identified) or a real health coaching session with a friend or colleague. Please note: A role-play is NOT an accurate format for assessing proficiency in health coaching or MI and will not be evaluated. The sample is evaluated by a MINT, HCPA-certified professional using the externally validated HCPA. Learn more about the development and validation of the HCPA. No additional fee is required for individuals who have registered for the MI Distance Learning Program. Students who do not achieve RHC-I proficiency will be eligible to resubmit a sample for re-assessment at the $250 fee after 30-days. RHC-II and RHC-III require higher levels of proficiency. The Registered Health Coach Program recognizes excellence and provides a pathway for building health coaching knowledge and proficiency. Registered Health Coaches are included in a PartnersinImprovement® national online Health Coach Registry® The registry is searchable by consumers, employers and purchasers by health coach name and state of residence. Organizations who require Registered Health Coaches will also be recognized for quality. 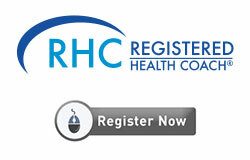 Visit the Health Coach Registry Site. Dr. Susan Butterworth, a lead contributor to the development of the HCPA and RHC program, hosted a webinar session overviewing the program. Please view now: Becoming a Registered Health Coach (RHC): Your Pathway to Proficiency & National Recognition. If you have further questions please submit a technical support form. How Will Recertification be Handled? To avoid duplication of recertification requirements and costs, you will simply recertify at your highest level of certification (on your CCP recertification date, which is now your RHC recertification date). While you will technically maintain your CCP certification, if you are an RHC-I, for example, you will receive a new RHC-I certificate valid for three years at the time of recertification. You will continue to be required to complete 15 CE hours every three years, and we will continue to provide CE opportunities to RHCs as we do CCPs. We may also include some type of proficiency reassessment in the future for RHCs. Building and maintaining your MI Health Coaching skills, like any other type of complex skill-set will be a lifelong endeavor. CCP and RHC-I are appropriate for members of the interdisciplinary health care team or beginning health coaches. 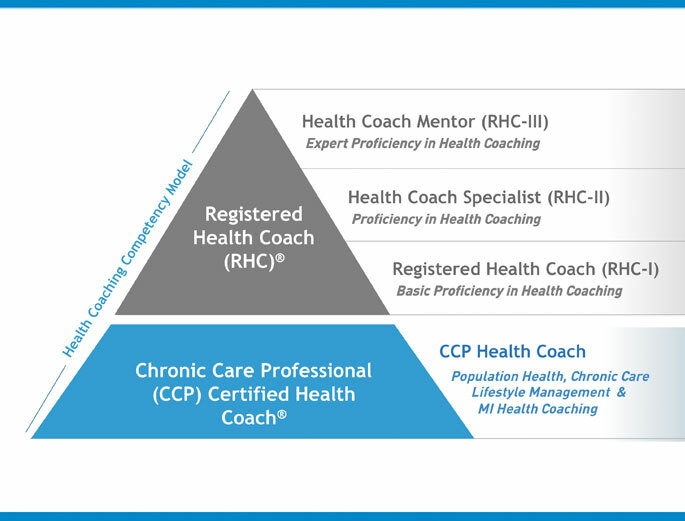 At a minimum, designated health coaches, case managers, or wellness coaches should be at the RHC-II (Health Coach Specialist level) or RHC-III (Health Coach Expert level). 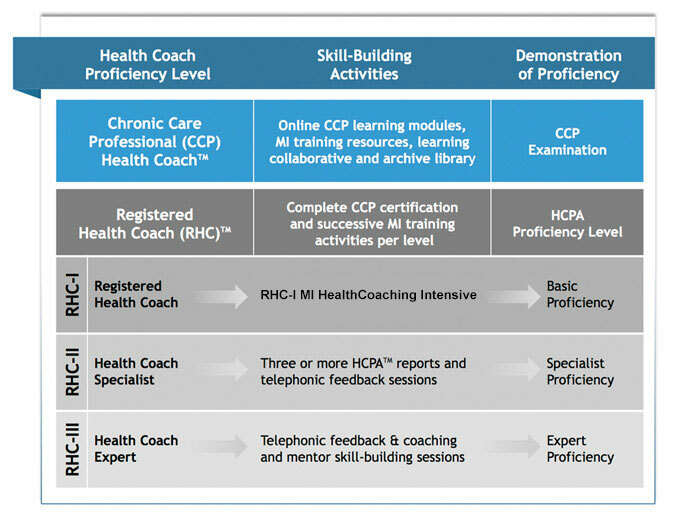 If you are a RHC-I, you have achieved the second level of the health coaching career/credentialing ladder and we encourage you to build and hone your skills. The training and proficiency requirements for RHC-II or RHC-III are detailed on the Registered Health Coach page at: //www.healthsciences.org/registered-health-coach.